State Health Director Loretta Fuddy was killed, but eight other people survived, after a small commuter airplane crashed into the ocean shortly after taking off from Kalaupapa Airport Wednesday afternoon. Star-Advertiser. Loretta Fuddy, the director of Hawaii's Department of Health, died in a plane crash off Molokai Wednesday. She was one of nine people aboard a Makani Kai Air flight scheduled to take off at 3:15 p.m. and fly to Honolulu. The flight crashed about a half-mile off the coast of Molokai. Civil Beat. Hawaii Health Director dies in plane crash off Molokai. According to the U.S. Coast Guard, 8 people were rescued, but Loretta Fuddy, 65, who is the director of the state Department of Health, did not survive. Deputy Health director Keith Yamamoto was rescued.Hawaii Reporter. Multiple sources tell Hawaii News Now that Loretta Fuddy, director of the state Department of Health was killed in a small plane crash Wednesday afternoon off Kalaupapa. Eight others survived. The Cessna Grand Caravan operated by Makani Kai Air reportedly went down at about 3:45 p.m. while heading from Molokai to Oahu. Loretta Fuddy, 65, became acting health director in January 2011, after Gov. Neil Abercrombie's first nominee, Dr. Neal Palafox, withdrew his name at the governor's request. 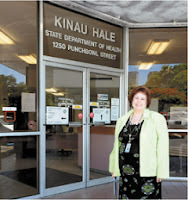 Just after being appointed and confirmed as the permanent health director, Fuddy made news in April 2011 when she verified the authenticity of certified copies of President Barack Obama's birth certificate proving that he had in fact been born in Hawaii. Obama had requested the release to end years of so-called birthers' claims that he was born in Kenya and not eligible to be president. Star-Advertiser. Even after Hawaii took over the top spot as the healthiest state in one national report, state Health Director Loretta Fuddy was advocating for even more services for the disadvantaged. Hawaii News Now. KITV4 has confirmed from two state government sources Hawaii's Health Department Director Loretta Fuddy died in the plane crash off Molokai Wednesday. The news is hitting close to home for those who worked with Department of Health Director Loretta Fuddy as well as those she helped. People who knew her say she was a genuine person who always cared for others. KITV4. 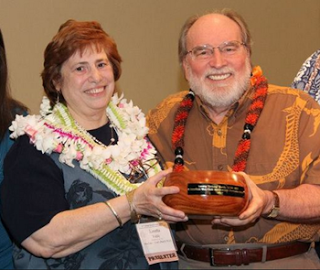 Governor Neil Abercrombie appointed Loretta Fuddy to her position more than two years ago. In her role as state health director, she also served as the mayor of Kalawao County on Molokai. KHON2. The Hawaii Tourism Authority plans to ask the state Legislature to make changes to a law outlining the requirements for a single tourism marketing plan and will implement other internal improvements after a critical state audit. The audit accused the HTA of poor stewardship of the public money that supports Hawaii's $14.4 billion visitor industry, which accounts for 20 percent of Hawaii's economy. Star-Advertiser. The state agency that is supposed to help academic researchers secure grants from government institutions and private funding sources is under scrutiny by Hawaii lawmakers who say it's being used to facilitate projects completely outside of its purview. The Research Corporation of the University of Hawaii is attached to the UH for administrative purposes only and is exempt from a range of state regulations, including the procurement code and certain civil service laws. Civil Beat. The Honolulu City Council gave preliminary approval Wednesday to a bill that would allow advertising on the exteriors of city buses. Bill 69 now goes to the Council Budget Committee for further discussion. Star-Advertiser. Honolulu City Council members shelved two resolutions that could have forced the city to either cancel or postpone the planned sale of 12 affordable housing complexes to a private group but also rejected a proposal to reaffirm support for the $143 million plan. Mayor Kirk Caldwell, who has been pushing Council members to support the so-called Honolulu Affordable Housing Preservation Initiative deal first reached by his predecessor, former Mayor Peter Carlisle, said he and his staff will meet with officials from Honolulu Affordable Housing Partners LLC today to try to salvage the deal. Star-Advertiser. A $142 million business deal that would transfer ownership of a dozen of Honolulu’s public housing complexes to a private developer was left on the verge of collapse Wednesday night. Civil Beat. Honolulu City Councilmember Ikaika Anderson will announce his plans Thursday regarding a homeless community under the Nimitz viaduct. Anderson's plan will involve using a state-owned vacant lot adjacent to the viaduct to provide temporary shelter and basic sanitary services for the homeless. He said he would like the city and state to work together in finding better shelter. The press conference takes place at 12:30 p.m. at the Makai lot of Nimitz Highway. Hawaii News Now. Current and former faculty of the University of Hawaii's Cancer Center are imploring the Board of Regents to support a change in leadership at the research center, citing a host of alleged offenses by embattled director Michele Carbone, including mismanagement of funds and retaliating against employees. Star-Advertiser. King's Village Shopping Center, a retail complex in Waikiki designed to resemble Honolulu around 1900, may be redeveloped into a luxury condominium hotel. A local development partnership that bought the center last year announced its redevelopment idea Wednesday, saying that planning is in a preliminary phase and that more details will be made public as they are finalized. Star-Advertiser. Organizers of this past weekend’s Honolulu Marathon say nearly 31,000 people signed up for this year’s race. As usual, about half of them came from Japan, many bringing relatives and friends. It’s simply the latest statistical reminder of the importance of the Japanese tourism market to the state’s economy. Civil Beat. Hawaii recorded its 14th shark attack of the year Wednesday as a 29-year-old Captain Cook man reported being bitten by a 10- to 12-foot tiger shark off Punaluu on Hawaii island. Star-Advertiser. A Captain Cook man is recovering from wounds to his hand and leg following an apparent shark attack Wednesday morning in waters near Punaluu Beach Park in Ka‘u. West Hawaii Today. Parker Ranch on the Big Island, one of the largest private landowners in Hawaii, could become a major energy player following the University of Hawaii’s recent discovery that the Waimea ranch’s land might have potential for geothermal resources, Parker Ranch CEO Dutch Kuyper told Pacific Business News on Tuesday. The county Board of Ethics, concerned that some Finance Department employees have a say about how their own property is valued for tax purposes, has scheduled a fact-finding hearing for next month. West Hawaii Today. The Maui County Council has gone to court to keep the state's public information agency from forcing the county to turn over minutes from a closed-door executive session. It's a case that could have significant ramifications for the state's ability to crack down on violations of the state's Sunshine Law, which requires meetings to be held in public. Civil Beat. The Maui Planning Commission unanimously rejected appeals Tuesday that were aimed at challenging permits for the Rock & Brews restaurant, with project partners that include KISS hard rockers Gene Simmons and Paul Stanley. Maui News. The Maui Planning Commission unanimously recommended approval of land-use changes that would allow expansion and greater development flexibility for the Maui Research & Technology Park in Kihei. Maui News. After a total of eight shark incidents in Maui waters this year, two of them fatal, Mayor Alan Arakawa shared with us his thoughts about mitigation and ocean safety. Maui Now. The Maui Highways Division will resurface Kahekili Highway starting Monday and continuing through April 30. Star-Advertiser. Kauai's auditor is claiming he's being retaliated against for an audit that reported a high-ranking elected official was improperly using a county gas card. Associated Press. The Hanalei Plantation Resort project has entered a new phase with the publication Monday of its environmental impact statement preparation notice. Garden Island.